Systems containing several short-period super-Earth/sub-Neptune mass planets are ubiquitous in the Galaxy. These systems are rarely found with planet pairs in mean-motion resonances (MMRs) — configurations in which the planetary orbital periods exhibit a simple integer ratio — but there is a mysterious overabundance of planet pairs lying just wide of the first-order resonances. Previous work suggests that tides may be responsible, but this explanation is insufficient unless there exists a significant and as-yet unidentified source of extra dissipation. I showed that this cryptic heat source may be linked to “obliquity tides” generated when a large axial tilt (obliquity) is maintained by secular resonance-driven spin-orbit coupling. I presented evidence that typical compact, nearly-coplanar systems frequently experience this mechanism, and I highlighted additional features in the observed planet population that may be its signatures. The orbital period of the highly inflated hot Jupiter, WASP-12b, is decreasing rapidly. The rate of inspiral, however, is too fast to be explained by either eccentricity tides or equilibrium stellar tides. While dynamical stellar tides are possible, they require a subgiant structure for the star, whereas stellar models point toward a main sequence host. I showed that these irreconcilable observations can be explained by planetary obliquity tides if planet b’s spin vector is trapped in a high-obliquity state maintained by a secular spin-orbit resonance with an unseen exterior perturbing planet (Millholland & Laughlin 2018). The hypothetical perturbing planet is within the limits of current radial velocity constraints on the system, yet is also detectable. If it exists, it could provide evidence in favor of the in situ formation hypothesis for hot Jupiters. Schematic representation of the proposed scenario. 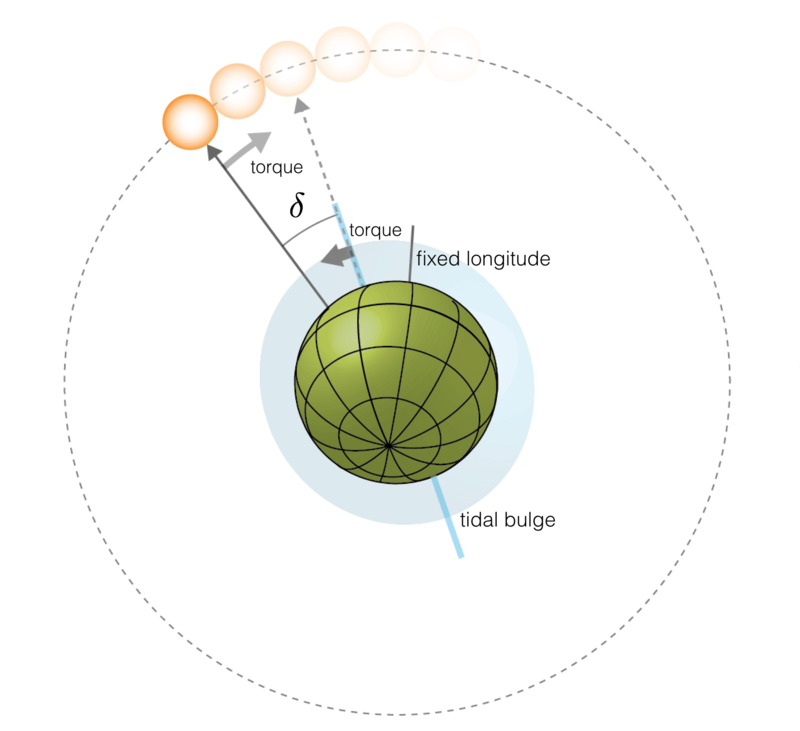 Planet b’s obliquity maintains a large value as it is forced by a spin-orbit resonance with an exterior, small-mass, as-yet undiscovered planet. The large obliquity for planet b leads to its rapid orbital decay.